The hamlets of Hoa Long (particularly Ap Tay and Ap Bac), Suoi Nghe, Duc My, Binh Ba and Duc Trung were in 1970 continually being infiltrated by VC. For example in March 1970 the number of known incursions into Hoa Long by groups of up to thirty in number was ten. Infiltration by the VC was aimed at demonstrating their presence by propaganda meetings, by terrorism and by showing the ineffectiveness of GVN security measures; and it was also aimed at obtaining food. There were therefore, profitable ambush targets to be had. Since Hoa Long was the most frequently entered,Lieutenant Colonel O'Neill invited the District Chief of Long Le to suggest how the Battalion could help.Major Tri said that previous attempts to prevent infiltration by ambushing outside Hoa Long had failed.Major Tri suggested ambushes be placed inside the village. The idea was accepted and two companies (C and D) were committed to this task. Furthermore a Phoi Hop (ie joint) Headquarters was to be set up in Hoa Long District Compound with the Battalion Command Post and Fire Control Centre collocated with Major Tri's Headquarters. On the 7th April B Company deployed on foot to ambush approaches to Duc My and Binh Ba and on the following day A Company deployed by APCs to the Ap Suoi Nghe area. Both these companies deployed half platoon ambushes. B Company west of Duc My had first contact when 5 Platoon moving into its ambush position on 8th April contacted three enemy in a small camp one of whom was killed. Again on the llth 4 Platoon contacted two enemy both of whom were killed. On the night 8-9 April C and D Companies had laid their ambushes in Hoa Long itself. This tactic unsettled the Vietcong and they began to ask local ox cart drivers what was happening. On the night of the l lth all ambushes were moved outside the village perimeter, first ensuring that the information would be passed to the Vietcong. This tactic brought immediate results at about 2300 hours that night, 9 Platoon C Company located just outside the village on the western side of Route 2, contacted approximately sixteen enemy. The ambush was sprung and mmediately the Vietcong force split into two groups and probed hard on three sides of the ambush. Contact continued forforty minutes and was only broken after a troop of APCs arrived on the scene from Nui Dat. Immediately following the contact the APCs swept the area for bodies with no results and a more comprehensive search the next morning was also negative. It was apparent that although the enemy had been well caught in the ambush they had managed to drag the dead and wounded clear and that the three sided probe had been mounted to cover the clearance of the bodies. It was evident that the concept was working and that the ambushes were proving highly profitable in terms of enemy contact. The following day B Company killed one more enemy in ambush. If further proof was needed the night of 13th- 14th supplied it, with an interesting series of contacts to the southwest and west of Hoa Long involving both C and D Companies. At approximately 0005 hours six enemy were seen by a half platoon ambush of 9 Platoon C Company. The enemy were running and crossed Route 2 about two thousand metres south west of Hoa Long. As they were moving across the front of the ambush at about 100 metres, the ambush was sprung. On contact the enemy turned north still running and moved out of sight of the ambush. Ten minutes later a group of approximately four enemy still running, moved across the front of a half platoon ambush of 10 Platoon D Company which was situated north west of the 9 Platoon C Company ambush. The ambush party opened fire, some enemy fell and the remainder again moved to the north. Forty five minutes later a half platoon ambush of 12 Platoon D Company contacted one enemy moving from the south east, who fell. Sweeps next morning produced two dead Vietcong from the C Company ambush, three dead from the first D Company ambush and one possible dead from the second. A perfect billiard ball effect had been produced as the enemy patrol had bounced from one ambush to the other and had been gradually whittled down. 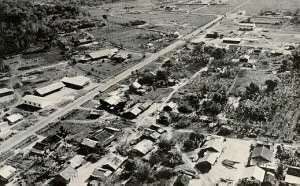 Subsequent information from a Hoi Chanh who was a member of the enemy patrol, disclosed that it had originally consisted of fourteen Vietcong of whom five had been killed. Further contact was made the same night when two enemy moved from the east into a half platoon ambush of 7 Platoon C Company who were situated outside the north eastern sector of Hoa Long. A further body was located the following morning in the area of this contact. The following night the Assault Pioneers in ambush south of the village observed enemy moving across their front at 100 metres and opened fire. Although the enemy returned fire, the results were negative on both sides. There had been a strong suspicion for some time that as well as Vietcong moving into Hoa Long, there were some located on a semi permanent basis in the village itself. Because of this, on the advice of Major Tri, it was decided to cordon and search Ap Bac, the north west hamlet of Hoa Long village, in conjunction with the local RF Company. The cordon was executed on the night of 18th-19th by the simple expedient of the companies in ambush in the village moving from their ambush positions to cordon positions round Ap Bac. Before the cordon was inserted at 0130 hours, C Company had a contact in the village complex killing one Vietcong. This was significant, as it was the first time a kill had been obtained within a village by the Battalion, proving that ambushes of this type were a feasible alternative to the outer barrier. The following day five hundred and seventy six people were screened and eighteen people detained. Operation Phoi Hop was an interesting and effective experiment. A Battalion had been deliberately placed in position to provide a barrier between three villages and the Vietcong. The material results in terms of enemy eliminated were good, but the subsidiary results were of equal importance. Subsequent intelligence reports specifically stated that the presence of A and B Companies round Duc My and Ap Suoi Nghe had effectively prevented movement into those villages during the period of Phoi Hop and that the Vietcong were worried and confused by the tactic. Around Hoa Long the same confusion was apparent with reports of Vietcong stopping villagers in the fields by day and attempting to extract information from them concerning the Battalion's activities. In addition, villagers began to volunteer information to the soldiers, a marked change of attitude in a short and around the Hoa Long area rose dramatically with six rallying as a direct or indirect result of the Operation. Phoi Hop proved that ambushing routes into villages achieves tangible and intangible results out of all proportion to the effort involved in mounting such operation, while retaining own casualties at a low level. 18 suspects detained in the cordon of Ap Bac.